Trude Viken is an artist I discovered while searching #contemporaryart, and is a perfect example of why I am sharing Instagram posts. Normally we get our art filtered through art publications and critics. It comes with the stamp of approval by some authority. I, on the other hand, rather notoriously if one follows my blog, defer to no one when it comes to art, and rely on my direct perception of the intrinsic qualities of the art in question. As I mentioned in my last post, I often find th esteemed critics to be outlandishly wrong about art, and can argue why. This may sound arrogant at first, but it the opposite — rather a rejection of smug authority in art — and I think there’s a way most people can relate. When I was a teenager I got bored with the selection of music played on the radio (and this is before the Internet, so, no other convenient venues for accessing music), in which case I sought new musical choices through buying cheap used records. I’d choose records based on the covers, names of songs, lyrics, selection of instruments (if it had a bunch of synthesizers I was probably game), etc. What I decided was good, and worth keeping in my record collection, was entirely up to my ear, and based on listening. I couldn’t afford to buy many records, so needed to return my less favorites for store credit in order to try out new records. Here you have an essential process of art connoisseurship. What works for a teenager and music works for an adult and art. And so it is not arrogant to say that you can and should trust your own eyes and ears, in which case a critic (such as myself) functions to introduce you to something or try to make it accessible, but is not necessary to give something the stamp of approval before you consider it in your own Pantheon. If you read the lone comment on the image, which was posted last November the 28th, it’s by me. If the same image were shared by Juxtapoz or Hi-Fructose it would have thousands of likes. The art world is rather like Hollywood: in order to have name/brand recognition, you can only have a small number of stars, and it’s probably already too late to apply. There’s also an element of The Party choosing art that supports The Party’s agenda in which case you get The Party’s art. Art should provide an avenue of imaginative escape and freedom from the restrictions of whatever narrative is being crammed our our throats. Let’s take a closer look at this painting. My goodness, there are a lot of people who will instantly love this piece — fans of rich impasto, Frank Auerbach, Francis Bacon perhaps — and another group of people who will dismiss it as a mess vomited up by someone who can’t draw. While the painting has a wild freedom about it, and is well within the epicenter of Expressionism, it’s very spare with almost no apparent wasted strokes. To pull this off so beautifully is an acrobatic feat of brush, eye, color, and pigment. 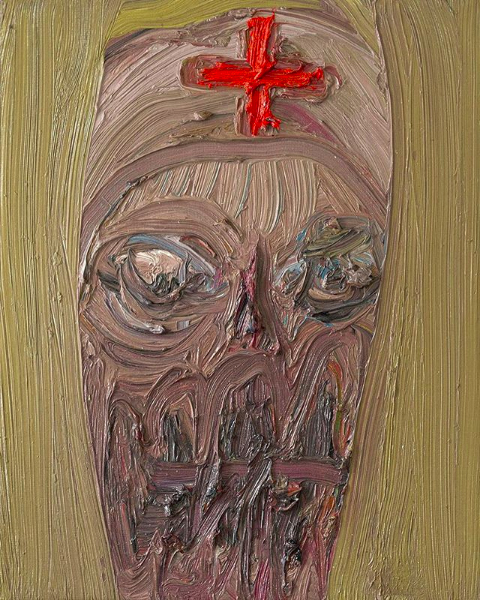 Yes, it looks like someone painted a nurse with cake frosting on a mud-cake in a lucid dream of visiting hell. How is that not a good thing? Notice how each stroke is evident — she is coming out of the school of Van Gogh (if he could only know how long his shadow has fallen on art). What makes this so great is the synthesis of means of representation. Texture, form, and rendering are all one and the same. The eyes seem like happy accidents, but are perfected in their incidental quality. The artist wants the painting to look like it just happened, and is an immediate impression straight off the emotions. It’s not fussed over, not an illustration, not even a painted person, but rather a paint being. This is something Van Gogh invented, Bacon ran with, de Kooning toyed with, Frank Auerbach perfected, and contemporary artists like Viken and Antony Micallef are keeping alive. These artists don’t use paint to render the appearance of the illusion of reality, such as to depict a subject naturalistically, but create an alternate reality where everything is composed of paint — Paint Man Cometh! It’s a flip side of conventional reality in that paint is infused with life, rather than life being rendered by paint. Paint has come alive and in its own way. So, you can image a sort of clay-mation type video where an artist’s paints on her palette start to form, on their own, into a visage, as if they were suddenly imbued with consciousness and sought to communicate with us. I am perhaps an ideal audience for this sort of art becuase, among other things (like Van Gogh and Francis Bacon being my 2 favorite artists), I’ve tried to create this kind of effect, er, digitally (because I can, that’s why). The Earthen/fleshy colors, subtle as they are, are sumptuously rich. The subtle blues, browns, and grays range from wood, to mud, to clay, to rust, to bruised flesh, and seemingly reflect a cloudy sky like a puddle. The cross emblazond in the figure’s skull is a deliciously vibrant red. The over-sized and jagged teeth, coupled with the mere triangle for a nose obviously suggest a skull. It’s a sinister image of a sadistic nurse (or doctor) if taken literally, but I think there is an ironic remove and a touch of humor. After all, paint can address hurt, but paint can’t hurt us. Posted in art, art criticism, Art O' Th'DayTagged art, art criticism, contemporary art, Expressionism, Impasto, painting, Trude VikenBookmark the permalink.